SEC Commissioners Express Support for Move to T2 in U.S. 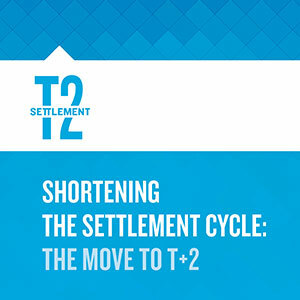 Following the release of a new industry white paper, “Shortening the Settlement Cycle: The Move to T+2,” two commissioners from the U.S. Securities and Exchange Commission (SEC) issued a joint statement in support of the financial industry’s efforts to move to a two-day (T+2) trade settlement cycle for U.S. securities by Q3 2017. The white paper, issued by the T+2 Industry Steering Committee (T+2 ISC) on June 18, outlines the timeline and activities required to move to a two-day settlement cycle in the U.S. for equities, corporate and municipal bonds, and unit investment trust (UIT) trades. Shortening the settlement cycle in the U.S. will substantially reduce operational and systemic risk across the industry, lower liquidity needs and limit pro-cyclicality. The shortened settlement cycle will also align the U.S. with other settlement cycles across the globe. The Depository Trust & Clearing Corporation (DTCC) has been a long-time supporter for the need to implement a T+2 settlement cycle. In October 2014, DTCC, in collaboration with the financial services industry, formed T+2 ISC and an industry working group (IWG) to facilitate the move to a shortened settlement cycle in the U.S. The T+2 ISC is made up of members from across the securities industry, including the Securities Industry and Financial Markets Association (SIFMA) and the Investment Company Institute (ICI). DTCC Partners with the Industry to Implement T+2 in the U.S.
Europe T+2: Is Asia-Pacific Ready?